I spent my weekend preserving, how about you? Canning season is well under way here in Utah, as everyone, it seems, tries to take advantage of the great harvest. Utah farms produce an astonishing amount given our location on high desert steppes, everything from peaches and cherries to cucumbers, squash, tomatoes and peppers. We picked up a flat of raspberries (12 6-ounce containers), several pounds of pears and peaches, some freezer pectin and sugar. My goals: Put up raspberry preserves (my favorite), pear preserves, raspberry-pear preserves and peach preserves. Originally, I was going to use recipes I found online, but after reading the back of the pectin package, I used Ball’s recipe instead. I’d trust them with my canning life, they’ve been around forever and almost everybody uses or has used their recipes or equipment. The formula is dead simple and works for a lot of different fruit. 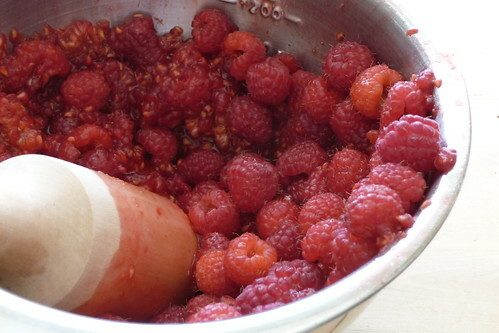 We prefer a semi-chunky preserve, so fruits that don’t crush well went in the food processor for a quick whiz around. I don’t know if using a processor is really advised, but it was certainly easy. Otherwise, we used a “stomper”, a Latvian-style wooden masher, to crush everything. Now, these preserves are very fresh and spreadable, so only use absolutely ripe fruit. Canning fruit is usually blemished and banged up, but the flavor is the only thing that matters. The pears this week on sale were superb, if they weren’t very pretty. 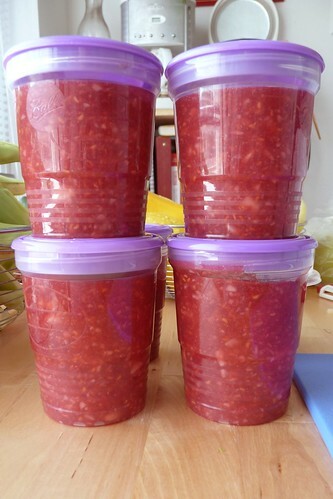 Ball advises that 4 lbs of strawberries is about 4 cups, but alas, strawberry season is over so we can’t make my husband’s beloved strawberry-rhubarb preserves. We couldn’t resist having crepes the next day to use up the remnants of our preserve-making binge, too! Mmm.. fruit-filled crepes. 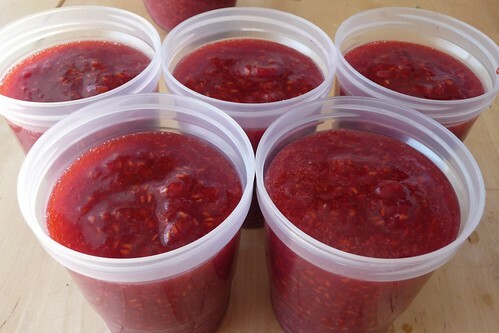 There’s still time to put up some jam if you have some extra freezer space. And, not to sound like a total shill for Ball, but their plastic freezer jam jars are really handy and easy to store. Stir together sugar and pectin thoroughly. Add fruit and mix for 3 minutes. 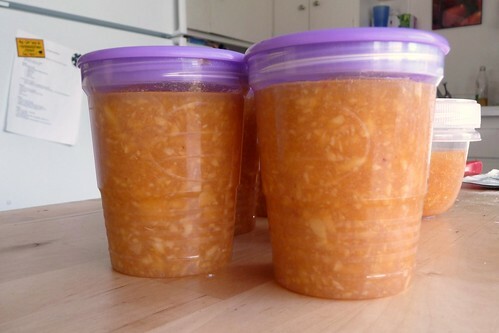 Ladle into clean jars or freezer containers and let set for 30 minutes. Freeze or refrigerate. Gradually add pectin and stir for 3 minutes. Ladle into clean jars and let set for about 30 minutes. Freeze or refrigerate. As always, don’t give spoilers a chance to survive. Make sure everything’s squeaky clean, from your work surface to your equipment and especially your containers and lids. This entry was posted in dairy-free, gluten-free, preserves, recipes, untranslated. Bookmark the permalink. You and me both! I still haven’t quite been able to bring myself to heat process and I didn’t think I’d be able to do any kind of preserving this year. But the no-cook freezer jams are so incredibly easy (and taste so very very good), the only drawback is that is makes me even less likely to make heat preserved jams! I have never thought of freezer jams. I can’t wait to give it a try. Thanks so much for the idea. Aww, thank you! I, too, fell in love with Latvia when I visited; she is an easy country to love. :) My husband tells me it can be difficult for kids there to be adopted, so thank you for considering them and helping out there!! If you are going to adopt some Latvian kids, I think having some recipes on hand from their home region, especially the most traditional and well-loved foods, will help them so much. I know it helps my husband when he misses his country and family (and me too). Right now, I’m only slowly updating the Learning Latvian site, but I am planning to put more stuff up there starting next week. One of the next posts will be a page on resources that I use and how to get them outside of Latvia. I was thinking about possibly posting some beginning lessons (like I work through) or vocabulary, would that be helpful / of interest to you? Thank you! We know quite a few people who have adopted children from Latvia but, as you may know, children are not available for international adoption from Latvia until they are 9 (unless they are a sibling group of 3 or more or they have special needs). This is a newer law as of 2008, I believe. This does deter most people from adoption since most seem to be looking for the younger children. That saddens me since the older children need a family just as much as the younger ones. Plus, having to make 3 trips to Latvia (with the first one being up to 2 weeks) also turns a lot of people off. I think beginning lessons would help me very much. I was able to get a Latvian language program online called Byki Deluxe and it has lots of vocabulary lists and such but I think it will still be difficult for me to really learn without being immersed in the language. I’ll be making pelmini tonight (yum) and I can’t wait! After I’ve had time to browse through your recipes, I’ll let you know if there’s something I’d like to see! I’ve only gone to Latvia in the winter, so I’m quite jealous of your husband who got to celebrate Jāņi there! I’m hoping to go back in a year or so during the spring. :) It sounds like he got to see quite a bit of the country! Latvian can be really difficult to learn on your own. There’s one decent-ish book (though it doesn’t focus much on giving lessons) available readily in the US called Colloquial Latvian by Christopher Moseley. It covers a lot of the grammar and provides some dialogues to translate. “Latviešu valodas rokasgrāmata. Tabulas un shēmas” by Anita Romane is absolutely essential, I think. It’s a book of tables, all the tables necessary to understand the language, from declensions to conjugations to adjectives, adverbs, you name it. I will definitely get a post together with the various resources I use soon. and yes, it is vocab and some phrases from the best I can tell. I haven’t used to too much yet. Thanks for the recommended books! I’m jealous of him for going during this time as well! We went in September last year and it was very nice then as well.